Did you guys know there is a protest sign generator online? There is a generator for EVERYTHING on the Internet. That’s why I love the Internet so much. I remember the lesson about passive voice from my first journalism class very clearly, and not just because my professor threw something at me to prove a point. Avoiding passive voice has been firmly cemented in my mind. At the Writing Center I worked at, I often found myself struggling with a future scientist trying to rid their lab reports of passive constructions (one of the biology professors was notorious for taking off points for passive voice). Even Microsoft Word angry underlines my sentences when I occasionally slip. But here’s the thing, it’s not usually a slip that Microsoft Word catches; it’s a purposeful choice. You see, passive voice has a purpose which is why it exists. Sometimes it just does the trick better than an active sentence. And even better, as this Poynter article by Roy Peter Clark, passive verb constructions can be active too! 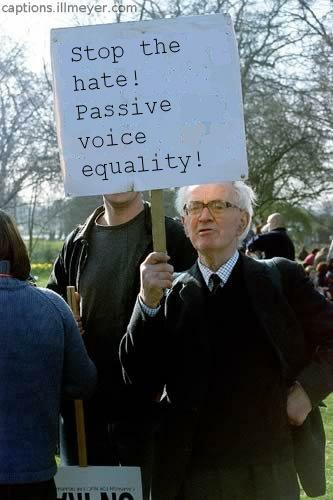 So, could we just stop hating on passive voice and realize it has a purpose like most other constructions in the English language? Writing with passive voice is about purpose not generalist, absolutist and fear-mongering avoidance. I am so glad you wrote this. In an effort to avoid passive verbs, my writing has suffered. Sometimes things just ARE.